Ubisoft announced that a new Assassin's Creed game featuring a new hero and time period will be coming in fiscal year 2014, which could be anywhere from this October to next September April 1, 2013 to March 31, 2014. Ubisoft president Yves Guillemot promised a major leap forward for the Assassin's Creed franchise and indicated that the development would be happening under the auspices of a new development team. Assassin's Creed III also featured a new protagonist and setting from past games—it took place during the American Revolutionary War and featured a half-native-American protagonist named Connor. Stephen liked the game, but Kirk was very disappointed in it, citing looping dialogue, a terrible last chase sequence, and more. In the end, Luke, Kirk and Stephen had a fairly epic three-way discussion about the game—the highs, the lows, the failures and the successes. 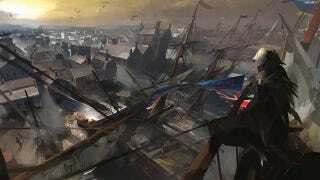 It'll be very interesting to see what Ubisoft does with the series in yet another new setting. This new game could be the chance to go to China, Japan or other locales that were previously speculated on. Where do you think the series should go next? The Evidence for Assassin&apos;s Creed III Being Set in America. Or China. Or India. Where will the next Assassin&apos;s Creed take place? When will it take place?